Self Cleaning Ovens sound like a dream come true for many householders. As one of the most hated household chores oven cleaning ranks among the top. So having an oven that cleans itself is something many poeple would like to have.. These ovens use a process called Pyrolytic cleaning which burns off grease and baked on food particles by taking the oven temperature up to 500 degrees. To reach that temperature, the oven door seal, and other sealing mechanisms, need to be working perfectly. The self-cleaning ovens have a self-locking mechanism that prevents the oven being opened during the cleaning process to prevent accidental burns from the very hot surfaces. During the cleaning process, the high heat burns off the grease and turns food particles to ash, which can be swept out of the oven easily after the oven cools down. However, there are some downsides and hazards to self cleaning ovens, like the production of smoke and fumes which can endanger the health of the occupants of the home. There have also been reports of fires inside self-cleaning ovens if it is very greasy or if food particles are left inside before cleaning. 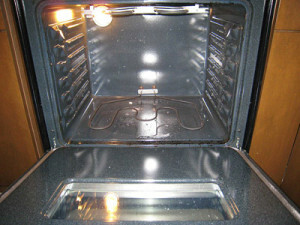 The efficiency of self cleaning ovens depends on the door seal giving a perfect seal. If the oven door seal has any flaws, it can allow smoke to escape into the room. The smoke can irritate the lungs of anyone nearby and be a health hazard for people with lung problems like asthma and for any pets like cats, dogs, parrots and other birds. If the smoke contaminates the water of aquarium fish, their health can also be affected. As the grease and food particles inside the oven are burned up. this produces carbon monoxide, an invisible gas which is toxic to humans and animals. If the room is not well- ventilated, the carbon monoxide can build up to dangerous levels. As it is invisible, the occupants of the house may be completely unaware they are breathing in a poison. The fumes can also cause irritation like burning eyes, stinging nose and throat causing unpleasant stinging and burning sensations. The fumes from self-cleaning oven with a poor seal can cause breathing probelms for adults, babies and children with asthma. Some users have reported fear and alarm at seeing fires inside their self cleaning ovens, If large pieces of food, or a large amount of grease is inside the oven when the high heat builds up, then there is a chance of fire and flames being seen inside. One major issue with self cleaning ovens is getting the oven to reach the right temperature for the burning of the grease and food particles. If the door-seal is faulty then the heat escapes and fails to build up to the full 500 degrees needed for the pyrolytic burning effect happen. Some partial burning may occur and hide the fact that there is still a grease build-up behind the removable liners. This buildup will affect the cooking process and can cause unpleasant smells and can also affect the taste of food cooked in the oven. The good news is self cleaning ovens can be professionally cleaned by specialist oven cleaning companies like iCleanOvens Oven Cleaning Service at no extra cost compared to regular ovens. You can find a list of tips for the safe use of self cleaning ovens to ensure they work at their best or check out our oven cleaning questions page.